I arrived home yesterday from my second consecutive weekend away at a cycling event. 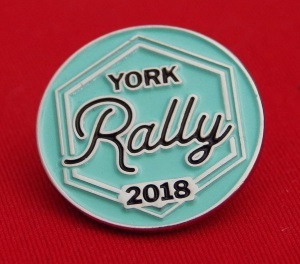 This time the York Rally, based at the racecourse in York. We just took the tandem to this event and we were surprised at just how many tandems were there. In fact there were bicycles off all sorts: tricycles, tandem tricycles, recumbent bikes – you name it and it was there. What a wonderful weekend! More low-key than the Eroica Britannia last weekend, this was very much a leisurely family affair. There was so much going on it was difficult decide what to do. There were various rides to go on from Friday evening pub rides to rides out of differing duration to visit interesting locations on both Saturday and Sunday. These often overlapped so some serious prioritising was necessary. Not being ones to frequent pubs very often we passed on the Friday evening offerings preferring to get ourselves organised on site and decide on our choices for the next day. On top of that there was also lots of activities on site so there was no need to go off for a bike ride at all if you didn’t wish. These included trade stands, children’s activities, talks a bike jumble sale (known as the Saddlebag Sale), Grasstrack racing and Cyclo Cross. 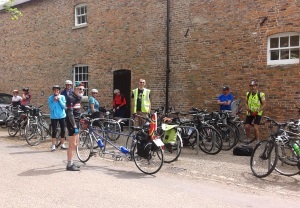 On Saturday we opted for what was described as “a gentle ride along the ‘Way of the Roses’ to the National Trust’s Benningborough Hall” where we stopped for lunch. This was listed as being 9 miles each way but in fact was slightly more and as we detoured on the way back to shop for a few food items we had forgotten we ended up doing around 27 miles in total, mostly off-road through wonderful scenery. The ride allowed us to return in time to attend the ‘Bicycle Poetry Workshop’ at 5.00pm led by Bernadette Cullen, a keen cyclist who was also poet in residence at Yorkshire Arboretum. She read some of her own poems and then gave us a few exercises to trigger our imaginations to come up with our own poems. Whilst I managed to write something for each of her prompts I failed miserably in the short time available (the whole workshop was only an hour) to produce anything resembling a logical poem, though there are one or two things in my jottings that I might be able to utilise in the days to come. In the evening we looked in on an excellent live folk music session with a group called The Foresters but it was crowded and hot so we only spent a short while peering in through the doorway. On Sunday we joined a ride through the Solar System from the Sun to Pluto and back! This was another off-road ride along York’s Solar Cycle Path. Along this route there are models of the planets in the solar system set at the correct (to scale) distances apart as well as more wonderful scenery. When you arrive at Pluto there is even a sign that points to Alpha Centauri stating the appropriate number of light years! If you wished you could then cycle on a few more miles to visit a couple of villages. My husband decided he wanted to get back in case he missed the Saddlebag Sale so we made our own way back – a round trip of about 17.5 miles. Back at the sale he managed to pick up one or two ‘spare parts’ that he was looking for so it was worth the return, but he did miss the Q & A session on ‘Flying Gates and Framebuilding’ (Flying Gates being a rather unusual frame design) he had planned on attending, but as he had spoken to the people on their trade stand on Saturday this didn’t worry him too much. We had also intended to join in the Grand Arena Parade but somehow, through heat induced fatigue we missed that too. An addition to the scheduled events was the landing of a hot air balloon in the early morning and then two also took off from the site in the evening, creating much interest. This was a truly enjoyable family event and one we shall ear-mark in the diary for next year. Maybe we will get our eldest son and his family to join us – our grandson would love it. Sounds like a wonderful time was had by all. It must be 60 years since I was on a bike but what a fabulous event I missed. Thank you for doing the pedalling for me.